Dubai, 13 November 2018 – His Highness Sheikh Mohammed bin Rashid Al Maktoum, Vice President and Prime Minister of the UAE and Ruler of Dubai, on Monday ordered another airlift of humanitarian aid to Jordan. Further to the directives of His Highness Sheikh Mohammed, Her Royal Highness Princess Haya bint Al Hussein, wife of His Highness Sheikh Mohammed bin Rashid Al Maktoum and Chairperson of International Humanitarian City (IHC), will continue to manage efforts to support Jordanian families affected by the floods and oversee the airlifts, working with the authorities in Jordan and the IHC in Dubai. According to forecasts, the region is expected to experience more bad weather. A Boeing 747 jumbo jet carrying 85 tons of humanitarian aid, including relief items donated by the UAE Red Crescent, landed in Amman, Jordan this morning. 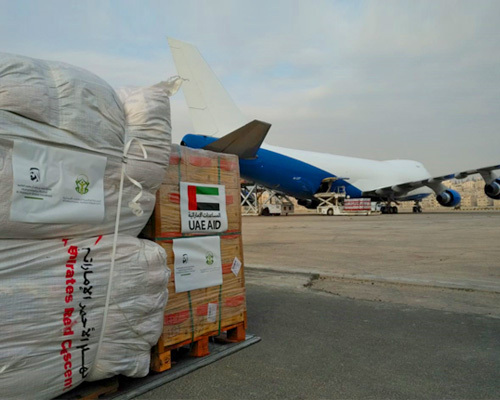 This is the third humanitarian aid flight sent by His Highness Sheikh Mohammed in less than 48 hours. 58 tons of relief items donated by His Highness Sheikh Mohammed have already been distributed to those in need by the National Crisis Centre, under the guidance of HRH Prince Ali bin Al Hussein, who received the flights and then coordinated emergency relief efforts on the ground.